Since the time of the first Nordic settlers, this horse has played an important role in Icelandic society. They were workhorses on the farms and transportation for both goods and men over rugged terrain. Although tractors and cars have now replaced many of their former duties every autumn the farmers mount their horses, as they have done for centuries, to search for their sheep in the remote pastures. The Icelandic horse came to Iceland with Nordic settlers in the 9th century. One of the first acts of the Old Icelandic Parliament, founded in 930, was to prohibit further importation of horses. This law is still in effect today. One thousand years of isolation and harsh climate has produced a hearty breed. Not only are they naturally gaited, they are sure-footed, intelligent, kind, willing, and extremely comfortable to ride. Today the Icelandic horse enjoys a growing popularity on both sides of the Atlantic as a pleasure riding and competition horse. FEIF, the international Federation of Icelandic Horse Owners, offers their members breeding standards and expertise, and the opportunity to compete under internationally accepted rules every other year. The World Championships have been held since 1970. 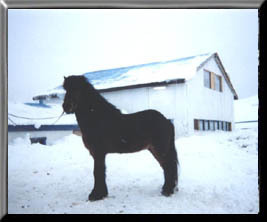 The Icelandic horse is naturally gaited, not only with the usual Walk, Trot, and Canter but also the Tolt and Pace. The Tolt also known as the running walk or single foot, has an even four beat rhythm that is smooth and comfortable to ride. The Icelandic horse can reach up to 30 miles per hour in Tolt. The pace is a two beat lateral gait used for bursts of speed. Flying pace horses reach up to 35 miles per hour.